We started by forming a circle with our exercise mats, candles and a rosary in the center. Renee explained what movements would go with each of the prayers, noting that she would vocalize the prayers, and, except for the Glory Be’s, we would pray in the silence of our hearts and minds. The movements with the Hail Mary’s vary as you move through the rosary, and, like any workout, they get gradually more intense, ending with warm-down and stretching. That third decade is a killer, let me tell you. Each Glory Be is a time of stretching in “surrender” pose (picture child’s pose) and the reflections on the mysteries are in rest pose, my favorite. You lie on your stomach, facing towards the center of the circle, resting your head on your hands in a pose that reminds me of kindergarten nap time, which is appropriate, as we are children of God, praying with a loving mother. Coming out of the reflection into the Our Father’s and Hail Mary’s, we rise though something like cobra pose, opening our hearts to each mystery. 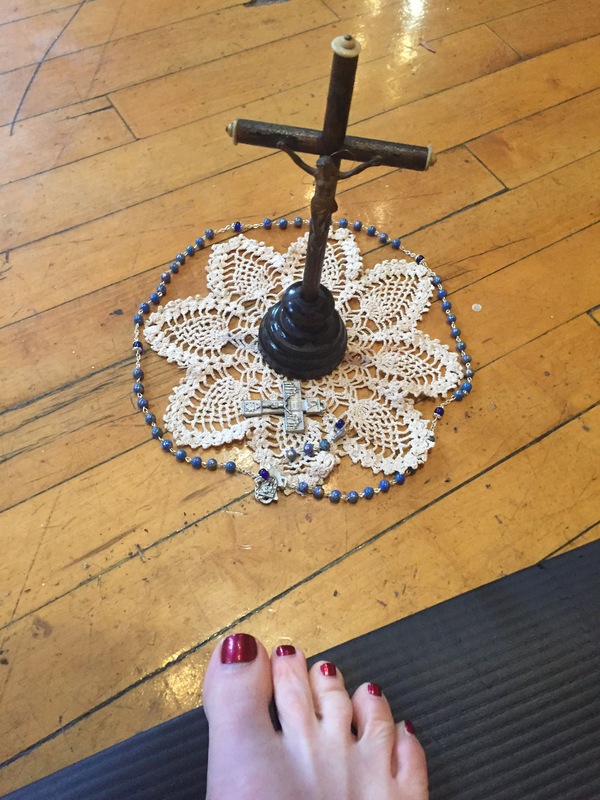 The session ended with a time of quiet reflection (thankfully done in a prone position) and I found the endorphins from the exercise lightened my heart and gave me a clarity of mind in prayer that was frustratingly missing to me sometimes when I pray the rosary. The physical exercise seem to take up the distractions of my everyday life and the prayerful meditations on the mysteries gave structure and purpose to my workout. (Trust me, not a feeling I usually get from my time on the treadmill.) SoulCore might have kicked my not-at-all-toned behind this time, but I’ll be back. Back to pray with my whole being. Previous Post Bibbidi, Bobbidi, Boys. Next Post Lions and Tigers and …Charisms? Oh My! I absolute love this! As a 5-year practitioner of yoga, but one who struggles to fit in daily prayer, this would be ideal for me. If only I lived in Philadelphia. They have downloads and dvds. That’s how I do it mostly! This is exactly what I’ve been looking for!!! Over the years, I have incorporated prayer and rosary into my running routine which I loved so much. It’s been years fighting injury after injury to get back to that running/prayer high! I have then doing yoga and incorporating the name of Jesus every time the yoga instructor said something “out there”. i am very happy to see something like this – even one step closer to my idea of a Catholic retreat and spa- a way to get away and get spiritually and physically renewed! That is such a great pedicure! Maybe you can write it off now? oh my goodness….i have been discerning whether or not to become a soul core leader and just very randomly came to your blog since you had liked a post I wrote…..wow….. thanks for sharing your experience!! There are no coincidences! Go for it! If I were younger, in shape, coordinated . . . I’d love to be a SC leader!